"I Kidnap My Boss' Brother Because Of Our Yahoo Deal Money"
A suspected fraudster has said he kidnapped his boss’ brother, Alvin Onuoha, because he was sidelined in a $30,000 deal from Yahoo online fraud. Uchenna Eze, an indigene of Imo State, was paraded yesterday with his alleged accomplice, Vincent Uchenna, by Lagos State Police Commissioner Imohimi Edgal. Edgal said the suspects and four others at large, committed the offence around 5:20pm, on April 6, in Ajah, Lagos. He said the suspects bundled Onuoha into a Toyota Camry saloon car, while he was about entering his compound. 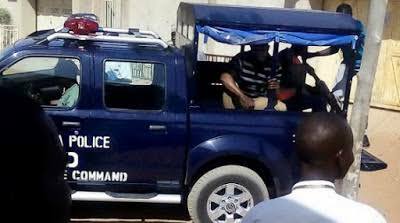 The commissioner said: “Onuoha was returning from work and on getting to the gate of his house, he was kidnapped by six men operating in a Toyota Camry and a motorcycle. He was taken to an unknown destination. “Two of the suspects were arrested when they went to collect the N200,000 ransom they demanded. During interrogation, the mastermind of the kidnapping, Eze Douglas Uchenna, confessed to have stayed with the victim in the same house. Eze said he only wanted to get his money from his boss, who was fond of denying him his share of their loot from swindling. He said: “We were into Yahoo business (Internet fraud) and he said whenever we made money, it would be shared on 60/40 percent. I agreed and brought businesses to him, but each time we made money, he would deny me my 40 percent share. “The first one we did together, we made $4,300. Instead of giving me my share, he gave me N300,000. I still stayed with him and kept bringing jobs to him. I finished another work and handed over the details to him so he could follow up with payment. “We made $30,000 from the job, but he kept telling me they haven’t payed. So, one of the guys who used to live with us in my boss’ room called me from Philippines and told me that he had made money and that he is now a rich man. “I went to my boss and asked him how far about the payment and he said nothing for me. That I was in the place to learn and not to make money. They started treating me somehow and since I was afraid for my life, I left the house last October. I slept inside tricycle for months until I met my friend, Vincent, and he introduced me to his friend, Matthew, who helped us in getting his soldier-friend and other boys to pick the man up.